The woes of Jitu Lohar (64) and his wife Geeta Devi (60) did not end even after the death of their elder son. While they were still busy bearing the brunt of their loss another setback followed when their daughter-in-law left the house to work in a brick kiln in a different state. Clouds of grief, hunger and loneliness hovered over Jitu’s head and therefore to feed his family Jitu began working as a blacksmith with a meager of 500 rupees per month. As, Jitu’s elder son was the sole breadwinner of the family so his demise stopped the financial availability also his younger son is still studying in high school, so Jitu took up the job once again. The Lohar family have been living in Dighilia, a small village in Bedo block of Ranchi district since many years. It was during the door-to-door campaign by Soochna Seva team on informing people about the government schemes when they got hold of Jitu Lohar in a small shop where he was working amidst coals and loads of sweat. The team went to his house and were moved after seeing the dilapidated condition of the roofs and walls. They inquired the couple about the important documents that could be important while applying for various schemes, but the response disheartened the team, as there was nothing to prove the citizenship, no BPL card, no Aadhar card, no bank account and not even a voter card. The couple expressed their plight for loosing hope every time when someone would take down their details and promise to provide them the documents and later on failed to live up to their words. The team of Soochna Seva pledged that at any cost they will try their best to facilitate the couple with a decent life. 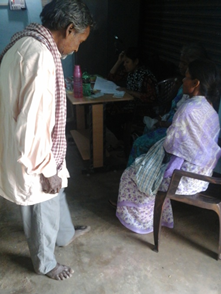 So, the team initiated the process by assisting the couple in applying for aadhar card and ration card. After a few days when these documents arrived at Jitu’s house, the couple came to Soochna Seva Kendra to fill the forms of Pradhan Matri Jan Dhan Yojna and Vridha Pension Scheme. It did not take long for smiles to roll on lips of Jitu Majhi and Geeta Devi as they received their first passbook under Pradhan Mantri Jan Dhan Yojna on June 4, 2015 which was opened in the Bank of India. Also, the money from Vridha Pension Scheme was deposited in their bank account. The couple thanked the team for their sincere and selfless effort.